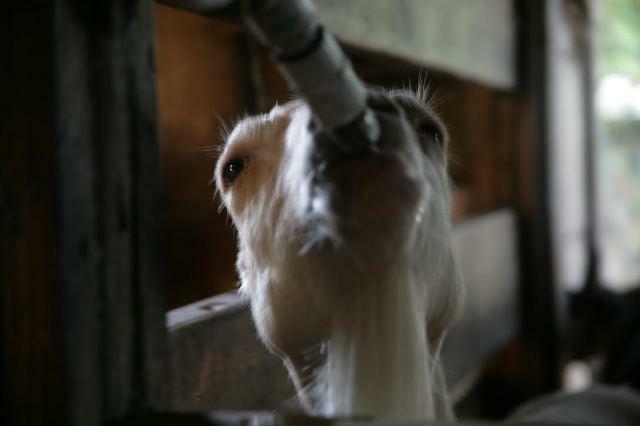 USFSP student Eric Vaughan shoots pictures of workers milking goats at the Dancing Goat Farm. 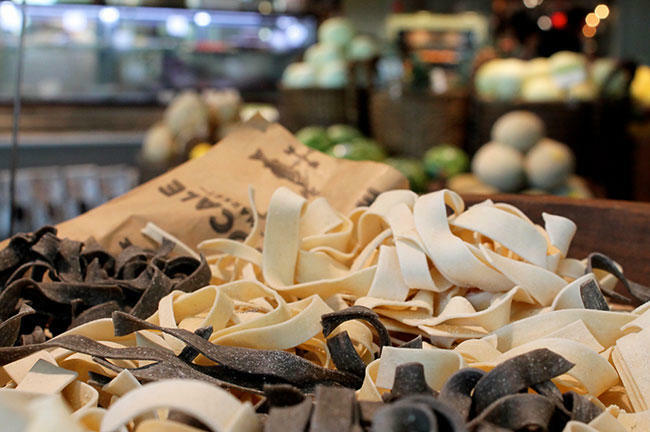 Freshly made pasta at Locale Market, as seen through the lens of USFSP student Anna Stebbins. 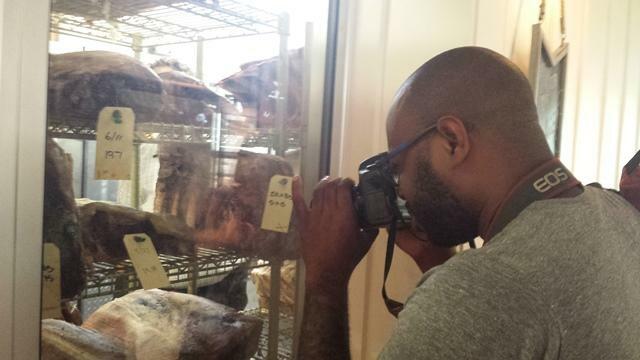 Vaughan sees what's in the meat refrigerator at Locale Market. 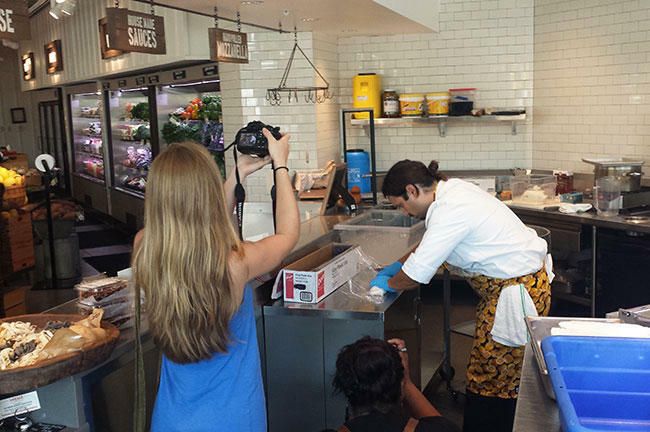 USFSP students Brigitte Toulon (left) and Anna Stebbins capture Locale Market chef Pedro Arreaza as he makes mozzarella cheese. 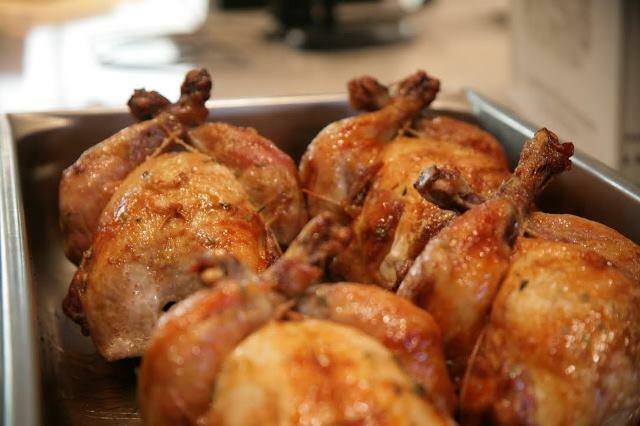 Vaughan's mouth-watering photo of chicken at Locale Market. University Beat report on the 'Sizzling Images' class at USF St. Petersburg. It’s not every class that has students taking pictures of chickens on a farm one day and then pictures of them – well, not so alive – as they sit on the grill at a market on another day. "The name of the class is "Sizzling Images," a short course in food photography, and so the purpose of the class is to immerse the students into the world of food photography," University of South Florida St. Petersburg visiting assistant professor Janet Keeler said. There were two unusual things about the course. First, it was open to anyone: undergraduates, students in USF St. Pete's Graduate Food Writing and Photography Certificate Program, even community members. Second, the entire three credit semester was packed into just one week. USFSP visiting asst. 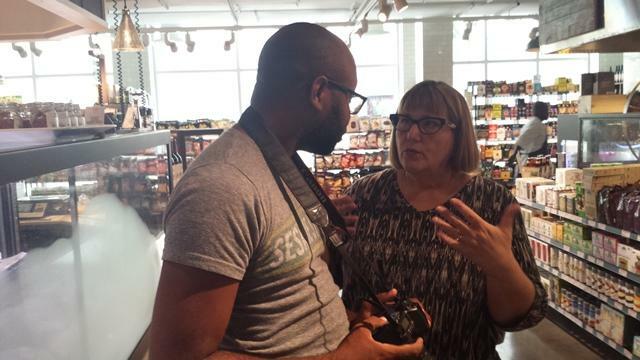 prof. Janet Keeler, who taught the 'Sizzling Images' class with her photographer husband, Scott, gives student Eric Vaughan some constructive criticism in Locale Market. "I’m amazed really at the difference between the photographs from day one to day five," Keeler said. "Every day you see them improving because they get this immediate feedback." That feedback came from a pair of instructors with a wealth of expertise. For over 15 years, Keeler was the Food Editor for the Tampa Bay Times. "We all know those gorgeous burger photos with the cheese dripping down and everything really makes you want to eat them, but there’s ways to take those photographs so they are appealing and that they do say something," she said. Technical expertise came Keeler's co-instructor, her husband Scott. The Times staff photographer shared his knowledge with about twenty students of various skill levels. "I mean, they’re not going to come out of here being Ansel Adams, of course," he said, referring to the famed landscape photographer. "But I want to get them out of what I consider the ‘big snapshot’ world of everyone taking pictures with their smartphone and I want them to think about the design of a photograph and the lighting of a photograph that they’re seeing in that viewfinder before they push the button." 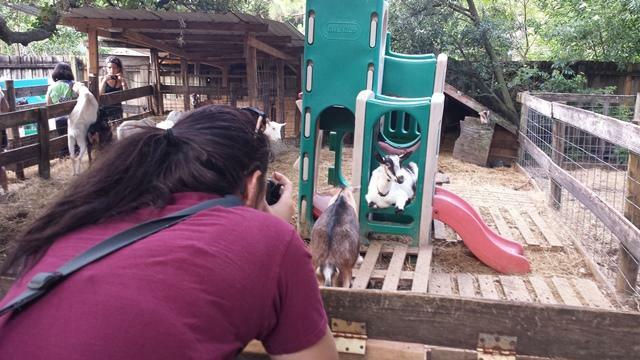 USFSM hospitality management junior Tiffany Sabroso snaps a picture of a goat at rest at the Dancing Goat Farm. The class took the students to a number of different locations, including Locale Market in downtown St. Pete, the Gulfport Tuesday Fresh Market, Vietnamese fusion restaurant La V, and the Dancing Goat Farm in Tampa. 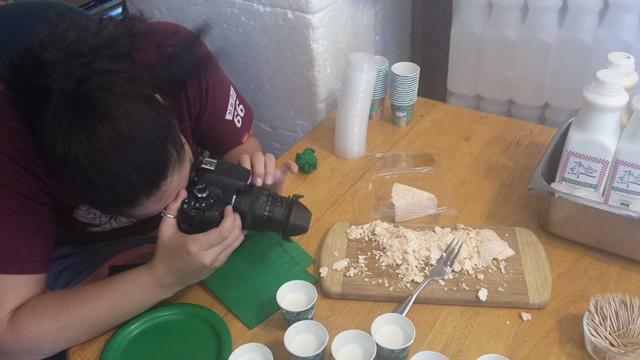 The field trips gave the students a chance to capture food in different settings, which Janet Keeler said helps them learn how to tell better stories with their pictures. "Many of the photographs that the students are taking really show a sense of place, which is kind of a neat thing in food photography," she said. "You’re not just right up on the food, you know, it’s macaroni and cheese but is it in your kitchen, is it in a market, is at the seashore, where is it?" It also allowed her husband a chance to show them how to better handle the variables of on-location shoots. "They’ve got to deal with shadows and various types of light in and outside the barn," Scott Keeler said while at the Dancing Goat Farm. "They’ve got to deal with moving animals that aren’t going to cooperate necessarily." 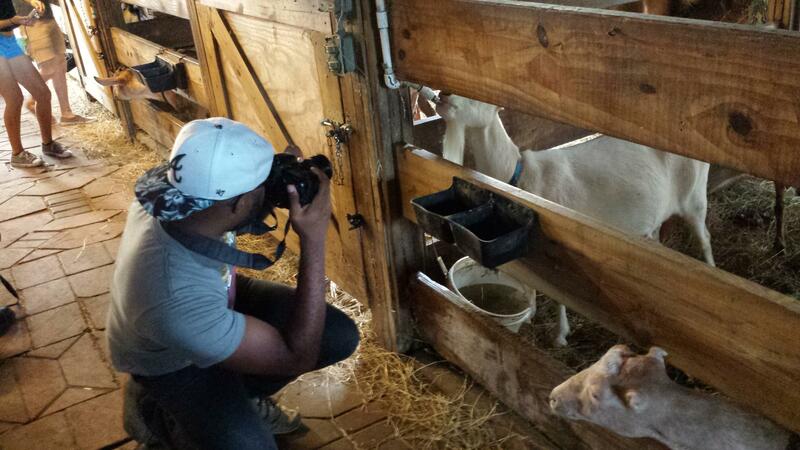 USFSP masters student Eric Vaughan gets up close and personal at the Dancing Goat Farm. At one point, three students did their best barnyard paparazzi imitation, snapping photos of a goat as she stuck her head out of her pen. While two leaned over to point their cameras at the less than amused animal, Eric Vaughan dropped to the ground and rested an elbow on the dirty barn floor to steady himself as he got the shot from a different angle. 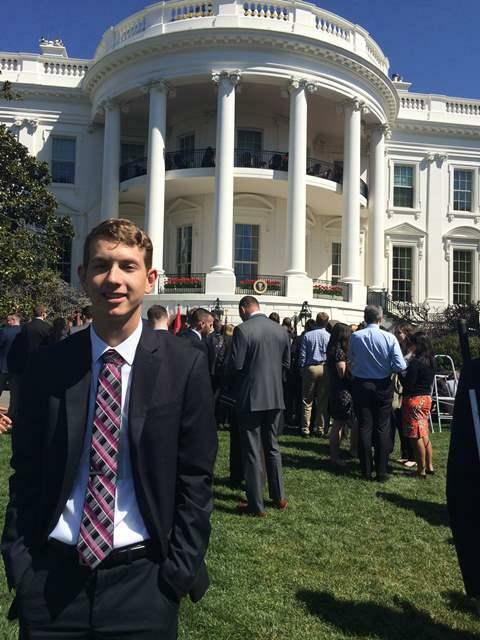 "It’s great, I think every class should have in-field experience and this definitely is," the journalism/social justice masters student said with a big smile. Vaughan's approach netted him this shot. "I’m getting pretty dirty, I’m laying on the grass and everything but it’s really fun," he added. "It’s fun to interact with the animals, it’s fun to just be outside of a classroom, out of the fluorescent lights for a few hours, so I’m getting a good kick out of it." And while fellow student Anna Stebbins admitted that she’s one of those people who enjoy taking photos of meals with her cellphone, she wanted to learn how to better use her more professional Canon camera. "Just working with this (camera), I was kind of pointing and shooting and I never really knew how to manipulate the settings and the f-stops, the shutter speeds, so now I know how to get certain light and more details with other parts of food and the dishes that I’m taking pictures of," she said. 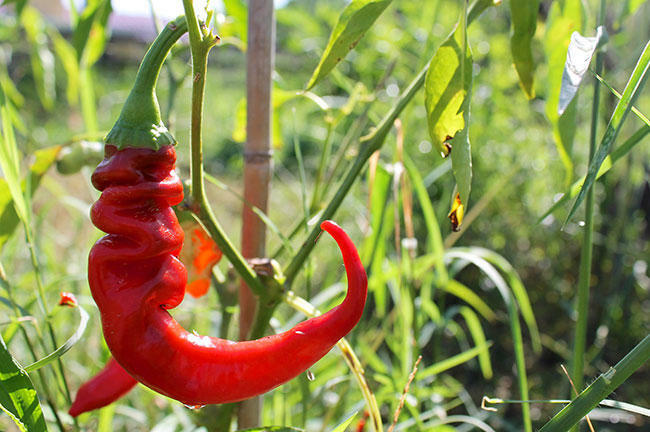 Anna Stebbins captured this picture of a pepper in a field at the Dancing Goat Farm. But Janet Keeler says there was a larger lesson in the class, one that goes well beyond simply capturing tasty snapshots of food. "There’s so many ways we can look at food as far as culturally and what it means to us and then there’s a lot of political and serious issues about food, the availability of food," Keeler said. "So there’s some very serious issues too; I mean food is the driving force that keeps us alive, so it’s more than social and more than fun, sometimes it’s a matter of life and death. So it’s good to know how to communicate about it." The Keelers plan to bring “Sizzling Images” back to USF St. Pete in January, with classes taught on five consecutive Saturdays. During this Thanksgiving week, we're taking a second listen to our show on food, family and traditions. From passing on the recipe for French Canadian meat pie, to making the perfect rice and meeting the bakers who make award-winning pies in Lakeland, our reporters are taking you into the kitchen. Spectacular firework displays are the grand finale of big Fourth of July celebrations. Boston Globe freelance photographer Aram Boghosian will be at Boston’s Charles River Esplanade for tonight’s event and has some tips for how to take great photographs.